Sting.com > News > BBC: "Sting 'electrifying' in own Broadway musical..."
Singer Sting is "a huge presence" in the Broadway musical he wrote and now appears in, according to one review. The ex-Police frontman is "electrifying in his two big solos" and has had a "galvanising impact" on the cast of The Last Ship, Variety's critic wrote. "Sting seems very much in his element," said USA Today's reviewer, praising the "blazing charisma" he gives his role. The 63-year-old is playing shipyard foreman Jackie White in his self-penned musical until 24 January. Previously lacklustre ticket sales have seen a boost since the singer confirmed he was joining the show for a limited period. According to the New York Times, "weekly takings have gone up by a couple hundred thousand dollars" since his first performance on 9 December. Despite this, its reviewer continued, "Sting's presence doesn't alter the chemistry of the show in any significant way". "He is more an onlooker than a participant," wrote Charles Isherwood, adding that Sting has a "more subdued approach" than Jimmy Nail, the actor he is temporarily replacing. "Nail, a robust singer and a powerful performer in his own right, brought a strong sense of suffering humanity to the role," wrote Variety's Marilyn Stasio. "Sting is more of an Olympian figure, rousing the men in anthemic numbers like We've Got Now't Else and the powerful title song to heroic feats way beyond their mortal limits." "Sting has been quite blunt about joining this company in order to raise ticket sales," continued Elysa Gardner in USA Today. "By taking on an age-appropriate featured role... he assumes the responsibility, and privilege, of supporting others as they bring life to his vision." Set in Sting's home town of Wallsend, The Last Ship tells of a group of unemployed shipbuilders who take over a closed factory to build one final vessel. Its main character is Gordon, a prodigal son, played by Michael Esper, who returns after 14 years to find the town and its community nearing economic collapse. 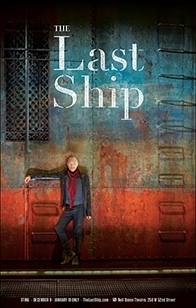 Sting wrote both the music and lyrics for The Last Ship, which continues at New York's Neil Simon Theatre.